Pregnant moms don't say, "I can feel the fetus kick." Not even an abortionist's pregnant wife would say, "The clump of cells just moved!" And the media knows it's a baby. Yet if Google News search results for July 28 and July 29 are any valid indication, hundreds of news stories reported the murder of "Darlene Haynes" without using the term "baby" to describe the child cut from her womb. Consider ABC News as a case study. One ABC headline reads: "Slain pregnant woman lived in same building with accused fetus-stealer." Boy, talk about identify theft. The media avoid the term baby and prefer technical terms that describe states of early human development in their effort to de-humanize the unborn child and prolong the age of de-criminalized abortion. The suspect, Julie Corey, was charged with kidnapping. But in a murder case, ABC referring to the fetus as a kid seems just too close for comfort. Just two weeks earlier ABC News did use the term baby to refer to an unborn child. Why? Because the context had nothing to do with murder, nor would it invoke the possibility of a dead child. ABC News referred to a fetus as a baby when Dutch researchers played vibroacoustic "sound to the growing baby" in the uterus. This ABC news report merely documents what we've been telling the public for years about the unborn child's ability to learn his mother's voice and even remember the songs she sings. The July 29 ABC News headline, for example, "Mom-to-be Darlene Haynes killed, cops search for her fetus," is followed by this copy: "Police … are searching for a fetus that was ripped from her mother's womb. 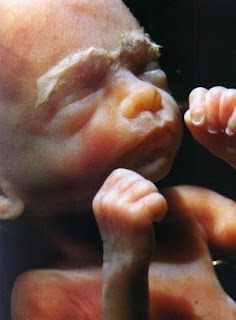 ... At 8 months, there is a chance the fetus could still be alive. …" If alive and outside of the mother's womb, it is technically inaccurate to refer to this little girl as a fetus. The murder of Wichita's George Tiller was not just a very late-term abortion. ABC's "fetus-stealer" notwithstanding, a survey of worldwide headlines show that after the child was found alive, the media became more comfortable using the term "baby." The day before, CNN's headline, for example, read, "Woman killed, fetus cut from body." But after the little girl was found: "Baby cut from murdered mother's womb is alive," ran in the AFP and USA Today wrote of the, "Woman accused of cutting baby from mom's womb."